There’s an old investor adage which goes something like “When in doubt, stay out.”. Sometimes the markets are just filled with dangers and uncertainty and low risk/reward, and at such a point, we have to advise our clients of said dangers. On the 13th of December 2016, the MICEX hit absurdly extreme levels of “overboughtness” in our adaptive channel system (shown in a separate Daily time-frame chart, available to subscribers), and we were forced to proclaim the current market level to be dangerous to enter at that time. The next day, the MICEX initiated a significant correction lasting almost two trading weeks, which brought the price to a neutral position in the adaptive channel. Early on the 5th of January 2017, or rather, a few days before, the MICEX had hit the 2260-target we’d set a couple of days earlier in a minor update not really worth mentioning here (hence, it’s non-inclusion in the chart). However, on the 5th of January, our combined technical analysis indicated that risk/reward for long (positive) positions had dropped, and that things had improved greatly for short (negative) positions, or just outright liquidation and going to cash. What followed was a drawn out decline over the next three weeks. On the 23rd of January 2017, the MICEX hit oversold levels in our adaptive channel, which we warned our subscribers of. Shorting at that time carried a bad risk/reward. Then, just days later, the Russian stock market shot up violently, and hit overbought levels again on the 27th of January, which we remarked in the technical analysis update due for that day. As it turned out, that overbought price level was indeed a bad spot to buy the index. From there on out, with our analysis methods, the MICEX was in a void. Possibly, an Expanding Triangle (see the Eliott Wave Theory guide for more information) was developing. On the 14th of February, we remarked that *maybe* the triangle had reached its end stage, and if true, then the MICEX would bounce strongly. However, there was a competing possibility in the short-term, which suggested a 3rd wave down was underway. Because there was no really good way to discern between the two, we clarified that according to us, Risk/Reward was bad for both positive and negative positions, at that spot. As it turned out, our adherence to the old market adage “When in doubt, stay out.” was totally justified, and the MICEX traded down almost -5% in the coming two weeks, a significant move, which our subscribers – if they had positive positions on the MICEX (and yes, most people only like to trade the long side of the market) – were sufficiently and accurately warned of. As for me personally, the last time I traded MICEX was in November-December of 2016, through index-following mutual funds, locking in a decent profit. Post that time period, predictability decreased enormously, and I’ve personally chosen to stay out of the MICEX for some time now. 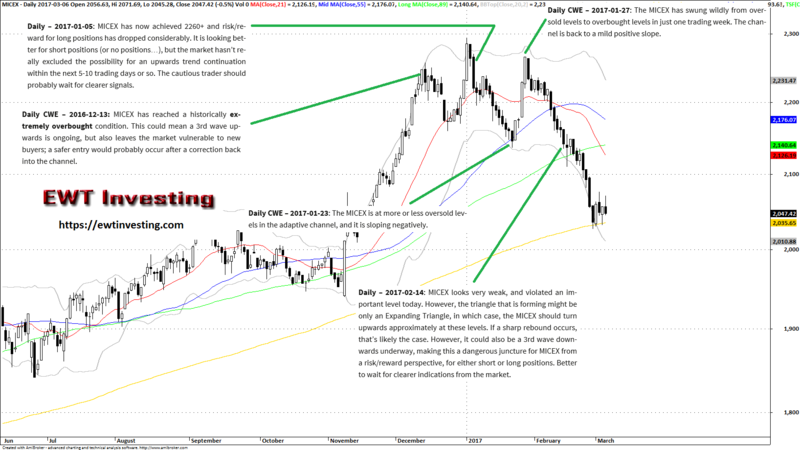 All in all, these MICEX technical analysis updates of ours, served their purpose in all cases, warning our subscribers about market extremes, and uncertainty/conflicting market possibilities which warranted staying out/managing risk carefully.